Once again, the fine folks at the Chicago Half Marathon and U.S. Road Sports & Entertainment Group have generously donated an entry for the September 11th, Chicago Half Marathon, which takes place on a beautiful out and back course that is actually run on LSD (no not that LSD, Lake Shore Drive). Details about the course and facilities etc. can be found here. and finishers receive a Custom finishers medal. Packet pickup will be at Navy Pier, Exhibit Hall B at 600 N. Grand Avenue. Expo hours are Friday September 9th from noon to 6pm and Saturday September 10th from 9am till 5pm. Admission to the expo is free and open to the general public but you will need to pay for parking. You can get an all day parking pass at the expo for $10 instead of the normal $23 the pier charges.. Just plan ahead, get there early and walk around the pier and enjoy what Chicago has to offer. There is NO Race Day Pickup on Sunday the 11th, so if you forget, you will be watching the race from the sidelines. The deadline for entry is August 26th and they are limiting the entries to only 20,000 this year. To enter our giveaway for a free race entry, just comment on this post and let us know what social media tools, if any, you use to complement your running or help you find running partners, groups etc. I will pick the winner at random on Tuesday August 2nd at midnight, so you have 3 weeks to enter. We will send the winner an email with their free signup code. Please only enter if you are able to attend the race and use the code. You are welcome to comment even if you don’t want to enter, but let us know in the comment to exclude you from the drawing. Good luck and see you at the race. Update – 8/2/11- I’m going to give this a few more day as no one seems to want a free entry. Come on people, it’s free!!! I will do the drawing next Monday the 8th. 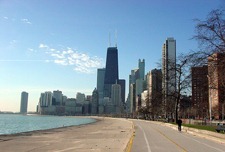 Once again, the fine folks at the 13.1 Marathon Series have generously donated an entry for the June 4th, 2011 Half Marathon, which takes place along the beautiful Chicago lakefront path. Details about the course and facilities etc. can be found here. 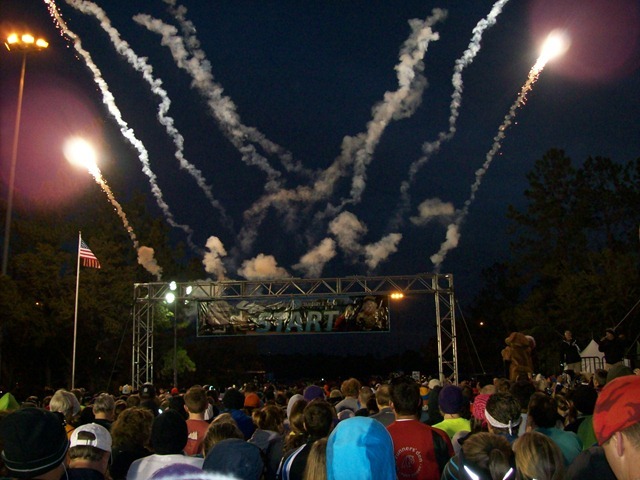 All runners receive a snazzy Craft tech shirt, a finish line party at the South Shore Cultural Center, a free beer from Michelob Ultra (bring your ID) and an awesome spinning medal for all finishers. Packet pickup will once again be a Fleet Feet Pipers Alley at 1620 N. Wells Street. If you have not been to the Old Town area in a while, parking is hard to find, so you may want to go with a friend and have one of you run in for pickup while the other circles the block. They had parking validation at a garage around the corner last year, but if that garage is full you are out of luck. Just plan ahead, or better yet, plan on spending a few hours, get there early and walk around and enjoy the neighborhood for a while. Pickup is on Thursday June 2nd from 4 – 8 PM and Friday June 3rd from 10am – 8PM. There is NO Race Day Pickup so don’t say I didn’t warn you. To enter our giveaway for a free race entry, just comment on this post and let us know how the cost of race entry fees has affected your choice of races to enter. I will pick the winner at random on Thursday April 28th at midnight, so you have just over two weeks to enter. We will send the winner an email with their free signup code. Please only enter if you will be able to use the code. You are welcome to comment even if you don’t want to enter, but let us know in the comment to exclude you from the drawing. Good luck and see you at the race. UPDATE: 4/28/2001 – The drawing is tonight so get your entries in. 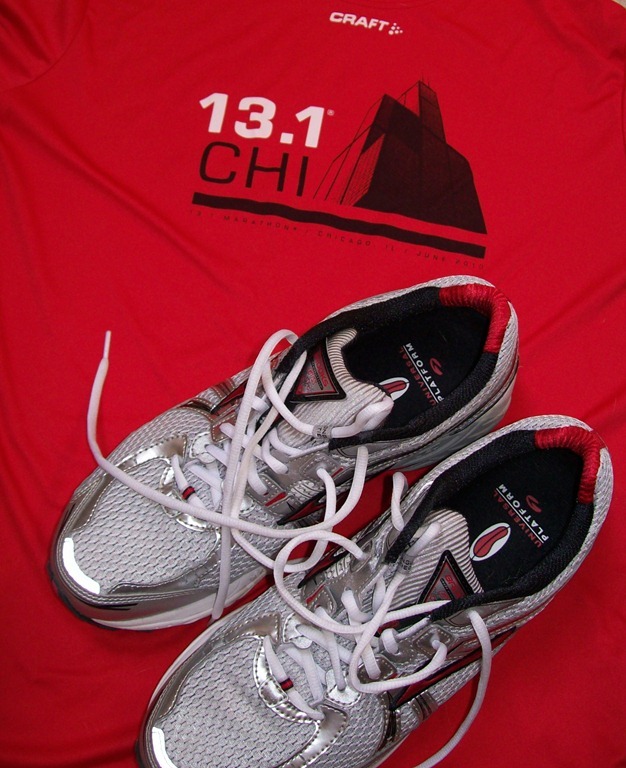 Update: 4/29/2011 – Congratulations go out to Kristan Huenink who is the winner in our random drawing for the entry in this years Chicago 13.1. Thanks to everyone for your insightful comments on the high cost of racing. We will have more giveaways this year so keep in touch. Today I experienced the first annual Home Team Charity Run 10K in Chicago. The event brought together 3 of Chicago’s professional sports teams to raise money for the local charities that each individual team already has relationships with. A portion of the $60 sign-up fee ($15) was divided equally between all three teams charities. During sign up, you were asked to select a team to support by selecting a particular race shirt design. You could select from the White Sox (my choice), the Bulls or the Blackhawks and your shirt would reflect that team in color and in lettering on the sleeve. All three shirts had the same logo on the front and white lettering on the sleeve. 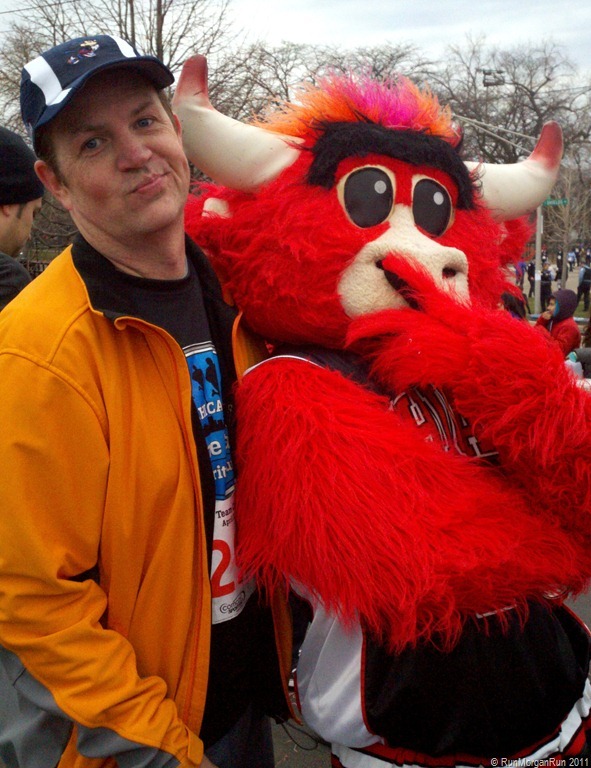 Besides being a White Sox fan I liked the fact that the Sox shirt was black, fairly unusual for a race shirt, while the Bulls and Blackhawks shirts were both the same red. I did notice while on the course that there was a much greater amount of Sox fans than the other two teams. You may be wondering why they left out the Cubs. Well, it’s because the start and finish of the involved the stadiums were the three participating teams play their home games. We started off at the United Center at 8am, in 41 degree windy weather, and finished at US Cellular field in 50 degree windy weather. It’s sounds a bit unpleasant but it was actually very nice once we got going and as long as you kept a few layers on the weather was unnoticeable. We were lucky enough to dodge the predicted rain, which held off until about 30 minutes after we finished the race. The race was fairly small with just over 2000 entries that showed up and they handed out the bibs based on last name instead of by sign up date. A bit unusual but it was kind of fun looking at peoples numbers and truing to guess their last name ( the guy wearing number 9, I guessed had a last name like Aaron). The start was also pretty loose with people just lining up wherever they wanted to at the start. One nice surprise was we were treated to a rousing rendition of the national anthem, sung by none other than Jim Cornelison, the gentleman who sings the anthem at every Hawks home game. With such a small number of runners, there was not much going on along the route except a few water stations, an aid station, one Mariachi band and one bag piper. While on that subject, thank you to all the volunteers who came out to provide the water and some support. It was pretty early on a Sunday for Chicago residents to be up and about in the neighborhoods. The race went pretty quick winding through the city streets, some of which were in bad shape from the nasty Chicago winter we had this year. There was one long stretch of almost half the race down Loomis towards 35th. Once we turned onto 35th we could see US Cellular less than a mile away so we knew we were almost home. The streets were wide enough that passing was not a problem and there were no four or five wide groups to deal with. At the finish in the north parking lot of US Cellular we were treated to a band, a free beer and a chance to have our picture taken with the Sox World Series trophy or the Bulls NBA Championship trophy. Southpaw, the Sox mascot, and Benny the Bull were also on hand for picture opportunities. I ran the race with my sister-in-law Mary, who is also a middle-aged runner, sorry Mar. She is a bit younger than me and a bit faster, so although I PR’d today, she beat me by about 30 seconds. All in all it was a very pleasant way to start a Sunday and it was nice to be out there with all the other Chicago sports fans having fun and supporting a good cause. I look forward to doing it again next year. 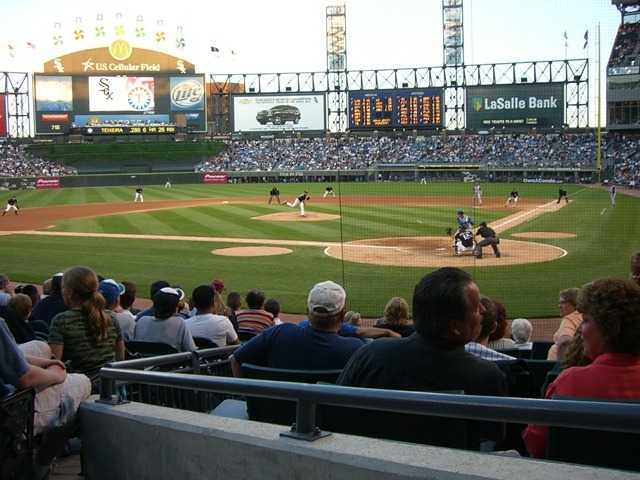 Tonight is our first sox game of 2010. I have been lucky enough to share some fantastic seats with a few other guys for the past 7 years. We have the first two seats located right behind the scout seats which are directly behind home plate. Ours are off set just a bit so we are not directly behind home plate and we are 11 rows up from the field. There are no seats in front of us so we can stretch our legs out if we need to. The only downside is no cup holders (I know boo-hoo) but I can rest my beer on the wall the separates us from the expensive scout seats ( that is the section where all food, drink, parking etc is included in the price, but they cost a full 3X what my seats do). My brother works with a guy who has had the tickets in his family for over 40 years (since the old Comiskey Park) and he was nice enough to let me in the group he shares with. Tonight is supposed to be cold and clear, so we will need to bundle up and hope they can beat the Twins. It has been a typical winter here in the Chicagoland area with lots of wet snow and cold to go along with it. As much as i would like to run outside I don’t want to deal with the drivers around here or the possibility of a slip/fall scenario. 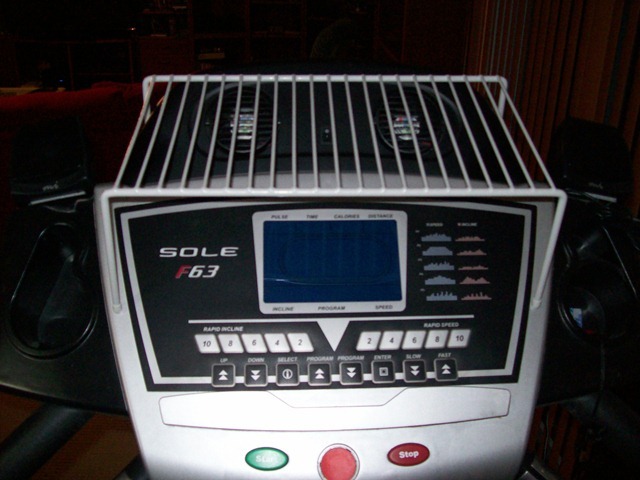 Being forced to run inside has allowed me to get very familiar with the sounds, smells and feel of our treadmill. As I mentioned in my post on January 13th, we have done some work on our latest treadmill and I am more in touch now with the feel of the machine. We have the unit setup facing the big screen so we can be entertained during the runs, but sometimes I wish I could read a book or blow through some emails while on a fast walk (running causes too much bouncing for me too focus on a book that close to my face, without glasses). I have looked at some of the other how to links on creating a table type surface for the treadmill but they were all too low for me. I need the material up at eye level so resting a board or other surface on the side rails, which the other solutions suggest, would not work for me. I made a quick trip to Home Depot to visit their shelving department and found the perfect item to use as a compact, breathable, self supporting shelving unit. 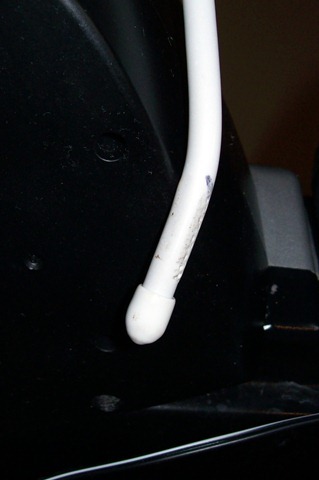 I selected a 4 legged metal shelf covering in a white plastic coating with small rubber tips. It was the perfect size for my brand of treadmill (Sole F63) and fit nicely in between the speakers I had added previously. My steps to create the shelf were as follows. 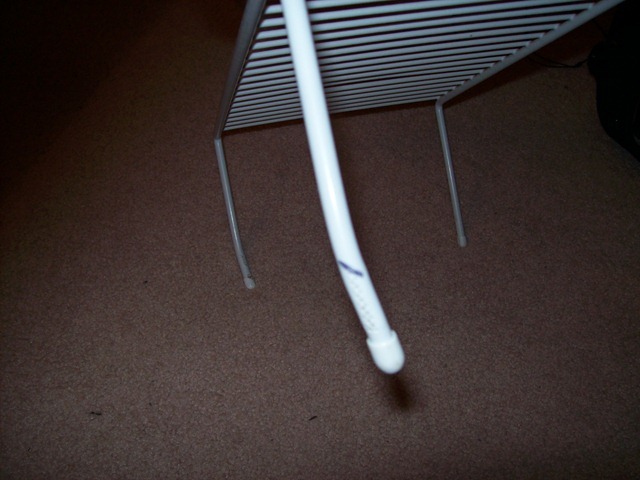 Place the shelf on the treadmill to estimate where to bend two of the legs so it grips the unit better. Mark the two back legs (facing away from the running surface) with a black marker so I know where and at what angle to bend the legs. Place one of the legs in my vice with the black mark aligned with the top of the vice. Repeat step 4 for the other leg. Place the shelf on the treadmill and make sure the bent back legs are snug enough against the housing to minimize movement (if not, repeat steps 4 and 5). 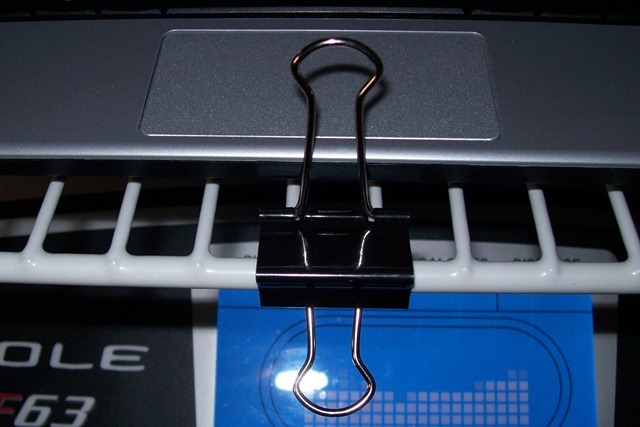 Take the three binder clips and attach them to the bottom edge of the shelf so that your book, computer, Kindle, iPad or other device does not slip off the angled surface while the treadmill is in use. You are now ready to walk and read, type, surf, Skype or whatever. Instead of just sitting around while I read, I can burn a few calories while I learn. There are many articles out there on how many calories you can burn while walking/running based on you height/weight/stride etc, so I won’t estimate here. Just do a Google or Bing search for calories burned while walking/running and you will have lots of data to refer to. Walk to read. Read to learn. Learn to live.